We spent this past weekend at the cottage with my family, celebrating belated and upcoming birthdays, relaxing, reading and indulging in good food and wine. The weather wasn't quite hot enough to swim, but the new deck proved to be a perfect spot to sit, take in the sun, and get lost in the amazing new book I had just started. It wouldn't be a summer weekend at my parent's place without Corona and Tostitos, but we decided to step it up a notch this year. 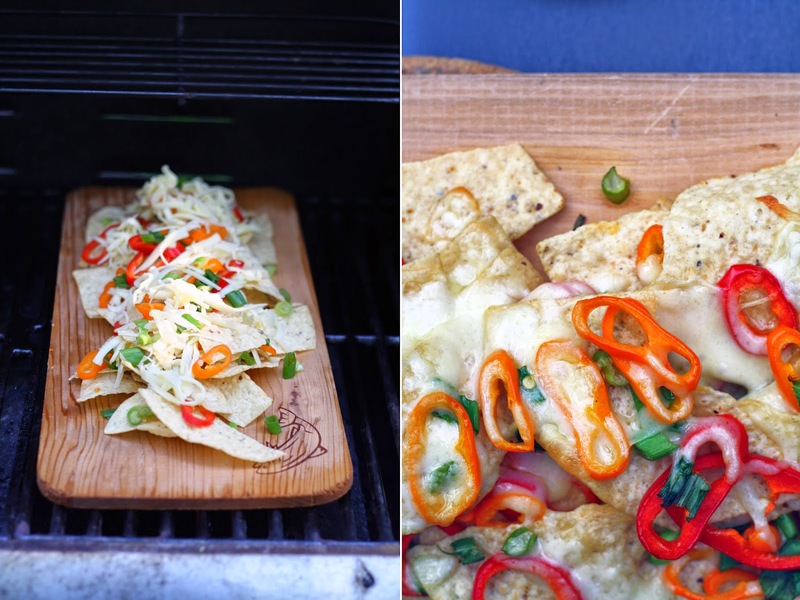 The idea to use a cedar plank on the barbecue came from some friends who recently hosted us for dinner. Genius really -- easy cleanup, smokey cedar flavour, extra crispy, and eliminates the need to turn the oven on, on those warm, sweaty night. Remove the cedar plank from the water, and dab dry with a cloth or towel. In a bowl, gently toss together the chips, scallions and peppers. Spread half the chip mixture onto the cedar plank, top with half the cheese, the rest of the chips and the remaining cheese. You want to create as even a ratio of chip to cheese as possible. Transfer the plank to the grill, close the lid, and cook for 10-15 minutes, checking periodically to be sure they aren't burning. Remember, if you're looking, it ain't cooking - so resist the urge to check too frequently. Once the cheese has melted and begins to bubble, the chips are ready! Serve immediately with salsa, sour cream, or guacamole.